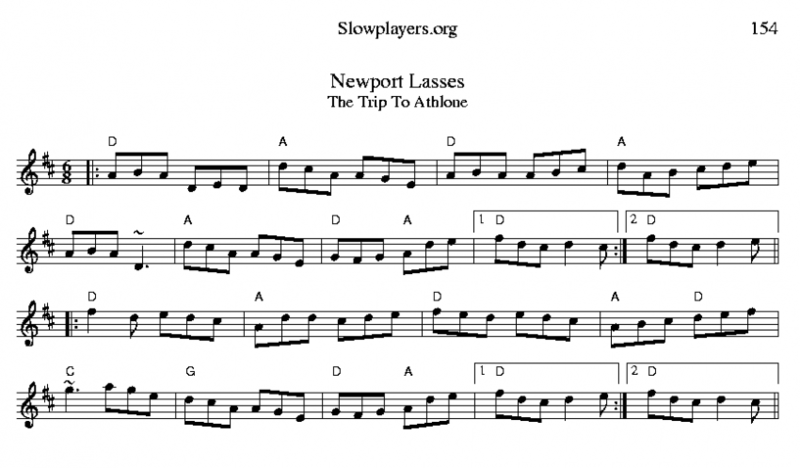 The double jig “Newport Lass(es)” or “Gearrchaile Bhaile Uí bhFiacháin” in Irish, is a two part jig played AABB, and also called “Trip to Athlone.” For instance, it’s called the latter on Paddy Canny (1919–2008) & P. J. Hayes (1921 – 2001) recording (with Peadar O’Loughlin, and Bridie Lafferty) entitled All Ireland Champions: Violin (1959), re-released as An Historic Recording of Irish Traditional Music (Shanachie, 2001). It’s also “Trip to Athlone” on the De Danann album Live in New York (1977), and on the Danú CD Think Before You Think (2000). It is called “The Newport Lass” on the album Matt Molloy. Paul Brady. 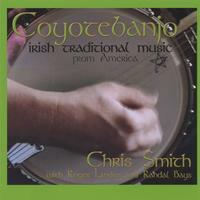 Tommy Peoples (1978/1985), and given both titles on Coyotebanjo (2005). I have it here in D, but it’s also played at some sessions in Dmix – by those who like the c naturals better (and then the A chords in the second and sixth measures should be C chords). Athlone is, in Irish, Baile Átha Luain, where Baile means “town of” and Átha Luain means “Luan’s ford.” The town of Luan’s ford is on the border between Roscommon (province of Connacht) and Westmeath (province of Leinster), on the River Shannon near the southern shore of Lough Ree, and is the largest town in the Midlands Region. Athlone Castle is in the center of town. Now Newport is a small town in Co. Mayo very near the coast, and is historically known as Ballyveaghan (or Baile Uí Fhiacháin in Irish). If a Newport lass took a trip to Athlone it would take about two hours by car if the weather and road conditions were cooperative. This article was posted in ABC format, Dots, Irish Tunes, Irish-American Culture, Jig, MP3, Slow Session, Tune, Tune Comment, Very Popular and tagged ABC format, Irish Jigs, Irish Session, Irish Traditional Music, Learning Irish Music, Recordings of Irish Music, Session Tunes, Teaching Irish Music, Tune History. Bookmark the permalink. Follow comments with the RSS feed for this post.Post a Comment or leave a trackback: Trackback URL. Every small donation helps to support the research on and posting of new tunes. Thank you in advance! © 2019 Slowplayers.org. All Rights Reserved. Theme By: StartupWP.